If you have been around inverters in the last several years you may have noticed GFCI outlets have become more and more commonplace. I often hear from frustrated users who routinely have to reset GFCI outlets after they trip. We are going to dive into what these outlets are, why they have become so common, and how to prevent some of the issues associated with GFCI. GFCI stands for Ground Fault Circuit Interrupter. This device is used to reduce risk of electric shock or fire by detecting current that is going down an unintended route. A 3-prong outlet has a neutral slot on the left, a line/hot slot on the right, and a round ground slot on the bottom. On an appliance all the current will go from the line to neutral when operating correctly. The GFCI closely monitors the amount of current flow from the line to neutral, and any discrepancies will cause the GFCI to trip and interrupt the circuit. This happens in less than a second and it takes just a few milliamps of discrepancy to cause the circuit to trip. We usually associate GFCI with outlets, but it is also used on the male plug of devices used outside, such as pumps, and there are even circuit breaker types that install in an electric panel. Why do we need GFCI and why is it so common in inverters? Safety, safety, and safety. Let’s say you are working outside in the rain or in a damp environment and the appliance gets wet inside. Your body can now become a path from the hot line inside the appliance to the ground. All of that electricity is now flowing through you, from the hot to the ground, which can potentially be fatal. With a working GFCI in place the discrepancy between the hot and neutral is detected immediately and is interrupted before harm occurs. As you can see from this example we need this GFCI protection in damp environments, and really anywhere there could be water. That is why we see these outlets in our bathrooms, kitchens, boats, RVs, and more. 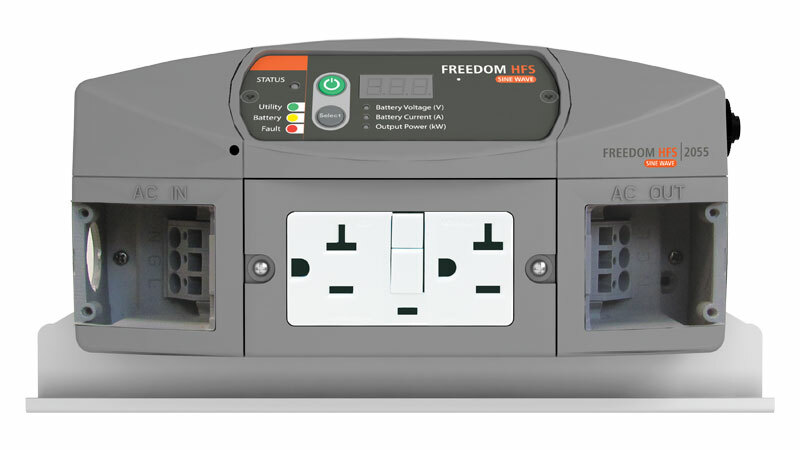 GFCI outlets are becoming commonplace in inverters for two reasons. The first reason is the potential for damp environments and increased water exposure in marine or mobile applications. The second reason is due to a set of stringent standards laid out by UL458. These stringent standards ensure you are getting an inverter designed to be operated in a mobile or marine application. In order to conform to UL458 standards an inverter must have ground fault protection, or have a large warning on the outside of the inverter indicating a lack of ground fault protection. Most inverter manufacturers choose to supply their inverters with GFCI outlets as part of this conformance. How do we prepare for GFCI issues? The two most common situations where GFCI outlets trip are when plugging in shore power or wiring up to an electrical panel. We can conclude there is an incompatibility when we consider the sensitivity of the outlets and that they were designed to protect you from a single appliance being plugged in. What happens is an electrical panel and/or the AC wiring can cause the GFCI to detect a discrepancy between line and neutral, as if there was a ground leak, even though there is not. These outlets were not really designed to have anything plugged down line from them, aside from the appliance and maybe an extension cord. Furthermore, your RV or boat likely has GFCI outlets located inside. Standard GFCI outlets tend to trip when they have other standard GFCI outlets down the line from them. If you need to energize an entire RV, boat, or electrical panel, I would recommend staying away from inverters that only have outlets. Inverters with a 3-wire AC hardwire terminal block option are designed and much better suited for these types of installations. These types of inverters with AC hardwire capability will often come with GFCI outlets as an option as well. I do not recommend altering the GFCI outlets or bypassing the ground prong as this can lead to other problems or hazards. Inverters with outlets only are suitable for plugging devices directly in or energizing a single 15-20 Amp circuit. Referring to how a GFCI outlets work and the purpose of ground fault protection is the most effective tool in preventing issues. Do not expect GFCI’s to do something they were not designed for. I hope you have a better understanding of how GFCI functions, why it is important, and the limitations of these outlets. Feel free to comment below and if you have any questions contacting us at 800-367-3019 or info@donrowe.com. « Converter, Chargers, and Converter/Chargers – What Do I Need?